The end goal is to have massively scaled channels that make up most of your growth. So how do you get there? You can break down a company’s SEO timeline into two parts: pre-SEO experimentation and post-SEO experimentation. In this post, I’ll focus on the pre-SEO experimentation part. The first goal you should set is to get 1,000 search sessions/day on one of your scalable landing page types. At this amount of traffic, you can start running SEO experiments at around 500 sessions per day per group, which should be enough to get statistical significance. Under this number, it is not worth building an SEO experiment framework because the numbers are too low to determine significance. A scalable landing page is a quality landing page that you can build hundreds or thousands of programmatically. Blog posts aren’t scalable landing pages because to scale you need to write content, and the home page isn’t scalable because there can only be 1. So, don’t count traffic to these towards your 1,000 search sessions/day. Note that these pages are still worth working on in early stages because they are likely significant sources of traffic, but long term if you are successful, your scalable landing pages should be most of your traffic. A big part of getting to 1,000 search sessions a day is just waiting after you built a quality SEO page. You have to wait for Google to crawl your pages and for more sites to backlink to you. However, you should leave your landing pages at a high-quality bar before “waiting” for traffic. This way, you can work on other high impact growth areas such as referrals or paid while your traffic slowly ramps up. Write a good SEO title and description. To get ideas, you can search for keywords related to your product and see what other sites are doing. There is a good correlation between pages near the top of the rankings and high performing titles. Make sure there is much content on your page and that the content is viewable in the DOM. If you look at any of the example pages above, you’ll see there is a lot of text and image content on the page. Some examples of additional content you can add are related content, reviews, comments, and descriptions. Make sure the pages link to each other and from other main pages in the product so that Googlebot can find them. Check your crawl rate on Google Search Console to make sure it is healthy. Fetch and render as a Googlebot to make sure your page displays correctly. When should I start investing in SEO? The time when you start investing in SEO depends on how promising the other channels can be for you, for example, paid or referrals. Typically, SEO has a longer ramp-up time than both of those strategies, so keep that in mind before investing. Paid on the other hand can get you high volume pretty quickly if you have high spend. I would suggest going in with the mindset that SEO takes at least 6 months before seeing significant results. Usually, you receive a high return on your time if you put in at least a few days effort getting the SEO basics right and letting that slowly grow though. In short, invest a little now, and perhaps more later on. Who should my first SEO hire be? If you don't currently have engineering resources to make SEO changes, your first SEO hire should be a web engineer. You need someone who can make changes to the page to increase your rankings. Non-engineering SEO experts are great to add once you have engineering resources to execute on an SEO strategy, but not before. Should I be focused on increasing backlinks? Backlinks are valuable, but the best way to increase backlinks is to focus on building quality pages. Most methods of "gaming" backlinks are also against Google guidelines and can result in a penalty. There is no good scaled way to generate quality backlinks, so most major SEO products don't put much effort here. If you improve the quality of your pages, you increase your ranks and your backlinks. Should I do keyword research? For scaled landing pages, the main thing you should check is that the sector in which you are trying to rank for has high search volume, and there are a few free tools that you can try for this. Since you are trying to rank for a wide variety of terms, you shouldn't need to do significant research into individual terms. However, for growing SEO on non-scaling landing pages such as blog posts, keyword research is more critical because there are usually fewer landing pages, and we want each page to rank for specific high-value keywords. Ahrefs.com is an excellent tool for this. Building a large SEO channel takes time, and from this post, you learned the basics about growing from 0 to a few thousand clicks a day. 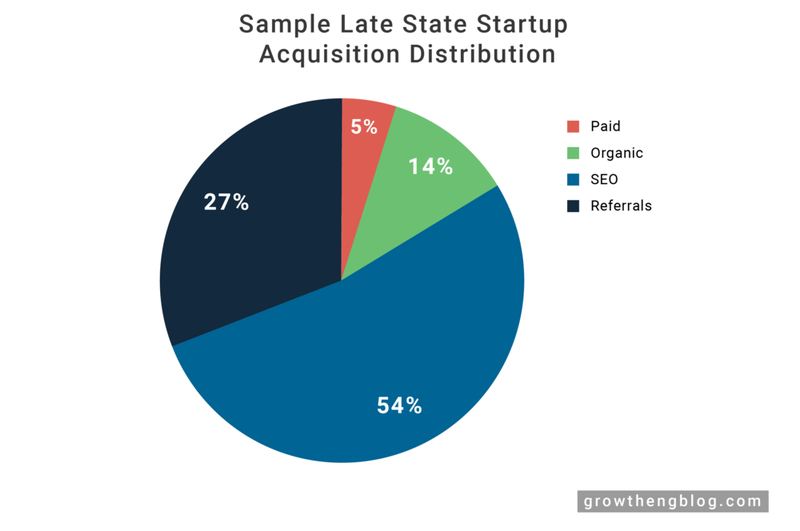 After, it's time to start investing in an SEO experiment framework to scale your growth even further. You can read about my guide to building an SEO experimentation framework here, and more advanced SEO tactics once you have that framework here.